Poker Perambulation » What is Mojo? Home > Tournament Play	> What is Mojo? Bloggers and friends can quickly give an answer. Dave Smith has never hid behind the MemphisMojo name. And, after the last few days, that should be an added solace. He’s been outed by name on a big stage. 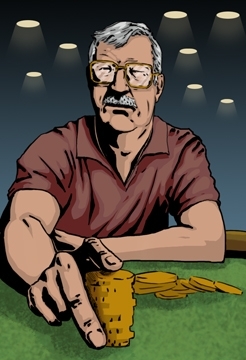 Tournament poker is a high variance pastime. A huge win can offset a lot of failure. Dave has overcome a lot of that variance in his play. Of course, we all want to question how. Dave laughing calls himself a nitty player. That is counter to a perceived high expectation result. Look at what Dan Heimiller said in his interview about playing the senior tournament. They’re standing right there, I don’t want them to hear it…don’t tell anybody. OK, they play their hands straightforward more often, and they tend to call, some players tend to call weak. So there’s about two or three players out of every ten that they call a little weak, so you have to careful too because you can’t bluff them so often as in other tournaments. PokerNews: They don’t necessarily know how to figure out what you’re trying to represent? They are more liable to believe that you’re stealing, they’re a little bit more paranoid than other players are. So you’ve got to be careful of that, and then they play their hands straightforward. Which means, if they have something they bet it, they tend not to check-raise as often. One of the players was a known professional — Sammy Farrah. If you look through the too limited coverage it show the yo-yo stack he managed before busting. The antithesis of Himiller’s typical player, as would be expected. Fast, hard play can have its early rewards but comes with much greater variance. Negreanu has promoted what he calls low ball poker. That wasn’t what the two pros above were promoting. And, it pretty much describes Dave’s path to the final table. What low ball seeks to avoid is the big coin flips. Dave was criticized for not taking one with 8-8. It might be a more suitable fold earlier. But, it is hard to critique where it fell. Three way, it is going to always be a slight dog to 4 perceived overs. The blind levels were asking players to gamble more. Where and when do you do that? Another known hand was the A6S against his AK. It was misplayed in some respect because of doing it with early aggression. But we all can make mistakes at the level of blind play. Had he just called and then gone all in on the flop, he might have won the hand. He seemed to have thought he wouldn’t have the chips to get a fold and may have been right. A6S is a good gambling hand; but, it wasn’t that time. Heimiller is right in part with his critique. But, right is transient in tournament play. I think the important part of tournament play is a different standard. The thing that has stuck in my mind is being able to change gears at the right spot. Dave did that. Dave survived a mistake against Maas with luck. But, he didn’t repeat it when others at the final table were willing to gamble that much. The thing the commentators are missing is that Dave has found the game that works for him. They were not aware of the consistent success his game plan has established. I’d thought that much of that success was site related. I have had that happen for me. You understand the other player or player types far more than they understand you. Dave proved I was somewhat wrong in that assumption but he also took from that experience a workable plan that went beyond the one location advantage. He proved that over the weekend. Representing is consistent work if you are a traveling salesmen. In is a selective game at a tournament table if you want to avoid the walk of shame. It is fun and profitable near the end where stack and blinds change the game. But, you can’t knock it when you’ve danced with the girl what brung you and it turns into a wonderful night. The hand reporting was weak from Poker News reporters. At the point Dave was down to less than two blinds it was only a short time later he had 910K. That’s the part I’d love to see documented. P.S. Heimiller was right about his thought in the final hand. The weak low blind call set it up for the straight. He’d have likely folded to a raise. Thanks, Ken, for your kind words. I think you understand tournament strategy better than some of the commentators. I didn’t just fold 8-8 to move up the pay-scale ladder. Yes, I did that, but I put myself in position to win if I had taken down the last pot with A-10 vs. his 4-4. That would knock Hiemiller way down, boost me to 6 million and who knows what would happen then? When and if Hiemiller were eliminated, I would love my chances against Maas (no offense to him), even if he had a lot more chips. The commentators gave superficial analysis, although they were entertaining. That was why I tweeted them that Dave is a crafty player. All they kept mentioning at first was his age. Heimiller seemed cocky. Of course, he is an accomplished player. My guess is that he made the big call against Dave because he was confident that he could get the chips back if he lost, and if he won, the tournament was basically over.